Help me welcome Spencer Saunders to The Weekly Racer! 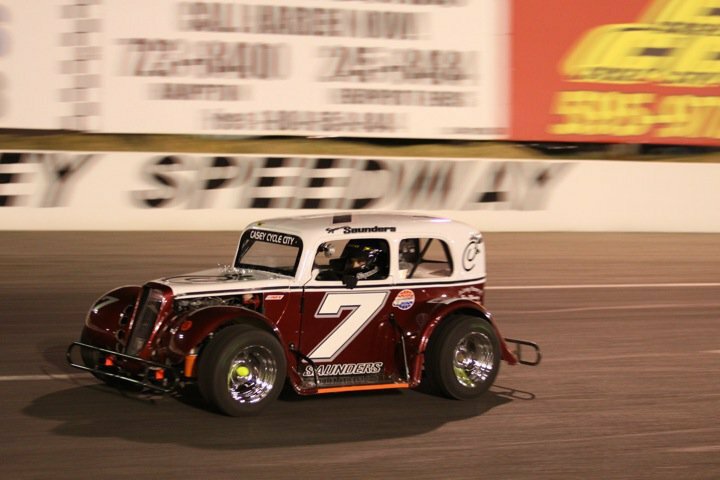 (Newport News, Va) Time to head back over the The Weekly Racer and check out this weeks new driver to be featured in The Driver Series, Spencer Saunders your 2013 Langley Speedway Legend track champion! Spencer like most kids in this area got his start in the Hampton Roads Kart Club.So again, this is a personal blog so I can be a little biased when! I became a fan of Spencer during Arena Racing. My father was able to help sponsor Spencer’s arena car for the season. At the time we were both taking classes at Thomas Nelson. Was a little bit of inspiration, that as long as your passionate you make things happen. Got to see him take his first ride in a Legends car. Saw the ups and the downs from the stands. So of course I was pretty stoked to see him come home with the championship this season. I have seen Spencer grow as a man and as a driver. Was running as high as P3 at Lake Erie this past year. Unfortunately (like we have seen in the past) was wrecked with 8 to go. This was Spencer’s second Virginia State Championship driving in the Legends division. Spencer took both cars back to Southern National Motorsports Park to take part in their annual Thanksgiving All-Star Classic. Starting and finishing P3. The Weekly Racer is happy to give you guys this. During the end of our conversation Spencer mentioned paying attention to this up coming season. Mentioning something about debuts and Late Model’s! Okay, okay, okay, lets just get to the point. You heard it heard first, look for a Late Model debut from Spencer Saunders in 2014! Thanks again for all that have read my blog. Thank you in advanced for all those who will help share my blog. Head over to Spencer’s page and get to know the man behind the #7!